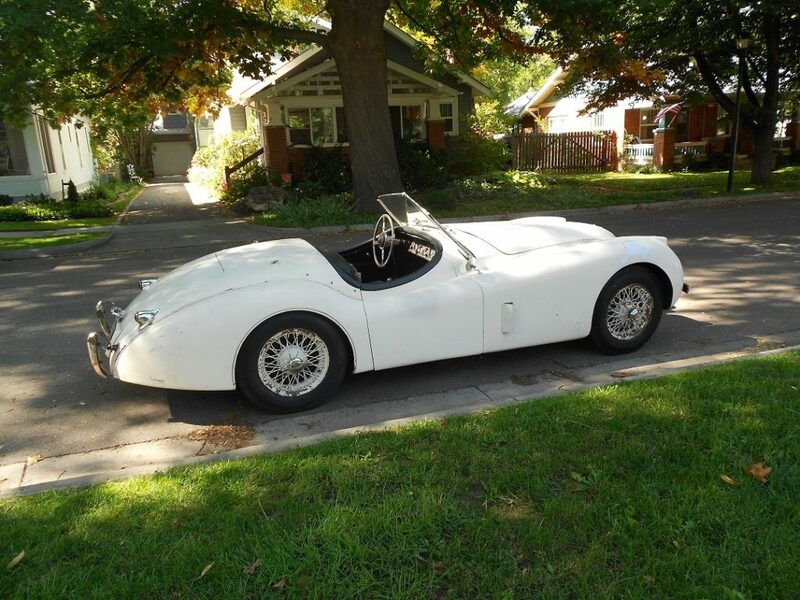 The SE model varies from the standard specification XK120 cars in that the famed William Heynes engineered 3.4 litre DOHC inline 6 cylinder engines were fitted with High Lift Camshafts, a Lightened Flywheel, a High 8:1 Compression Ratio as denoted by the “8” in the engine number (standard XK120 engine compression ratio was 7:1) which produced 180 BHP (vs 160 BHP from the standard). The SE models were also fitted with 54 spoke Wire Wheels with Chromed Two-eared Rudge-Whitworth Knock-Off Hubs (as opposed to the standard steel wheeled cars with rear spats), Stiffer Front Torsion Bars, and a 3-31:1 High Ratio Rear Axle. 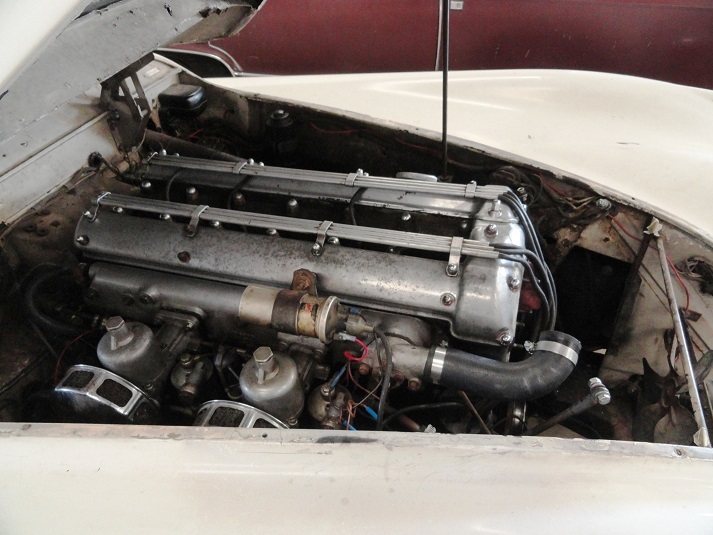 The 4 speed Moss Box transmission (synchromesh in 2nd, 3rd and 4th) was used on these cars and through the early XKE model cars. The prior owner purchased this car April 13, 1971 in St. Louis, MO (original For Sale Ad from the St Louis Post Dispatch newspaper included with records). 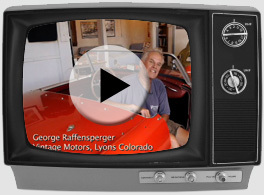 He shipped the car to Colorado when he moved here on June 14, 1995. 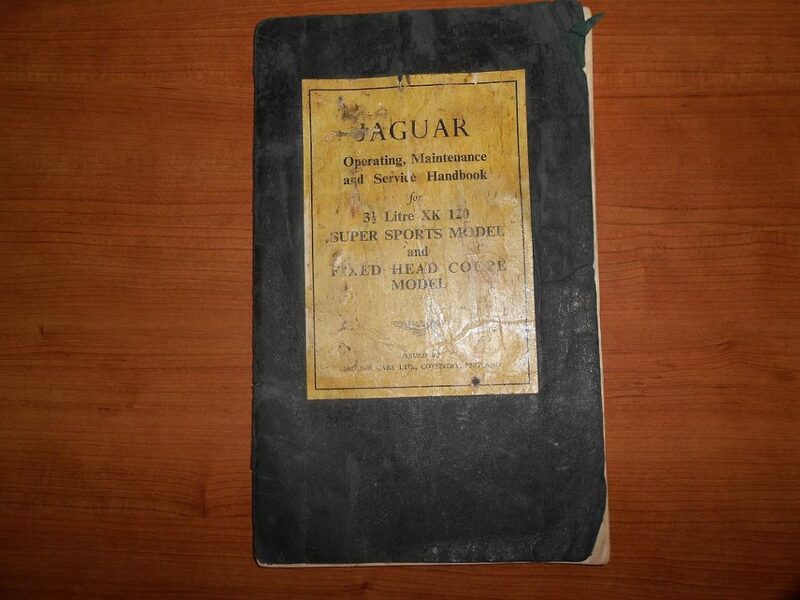 There are very good service and registration records and receipts with the car dating back to August 1968. 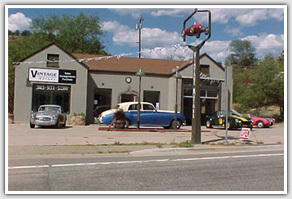 The car has but 55,000 original documented miles and is sold with a clear, Colorado Actual Mileage title. The car had been stored in dry storage for approx. 9 years before being professionally resuscitated in 2013. This included New brakes, brake lines, wheel cylinders, tires, battery, battery cables, fuel filler hose, fuel lines, water pump, V belt, coolant hoses, thermostat, filters; radiator boiled out; rear diff re-sealed; all fluids changed; gas tank and carbs cleaned; tuned; etc.. Car starts readily, idles steadily, and runs well; no smoke, spewing, adverse noises; very little in the way of any drips. The car drives well and crisply without shimmy, shakes or rattles. The engine pulls smoothly and strongly with a very pleasing exhaust note. The handling and steering are good. The clutch and transmission are both good and shifts up and down without any snicking or grinding. The car stops well on its new brakes and does not pull. There is some rust but the underside/chassis is good. The worst of the rust is in 3 places: at the rear seam between the right rear fender and the lower right rear panel surrounding the boot, below the right door strike plate and the area behind the drivers seat. The body, aside from a slight kink in the left side of the bonnet, is mostly very straight with good gaps at doors, boot and bonnet. The interior is serviceable, carpets are largely gone and there is a tear in the upper right seat back. Dash is good and complete. Horn, all lights and gauges working with exception of fuel gauge. The steering wheel is a Bluemels Brooklands; there is also a nice old vintage rallye gauge mounted in the passenger side dash. The right side of the windscreen glass is cracked at the lower outside corner. There is a spare wire wheel with an old Dunlop tire mounted on it in the boot (the four other old Dunlops were saved too) along with the jack and the tool kit with most all of its tools; the original grease gun which mounts on the inner left fender under the bonnet is there too. 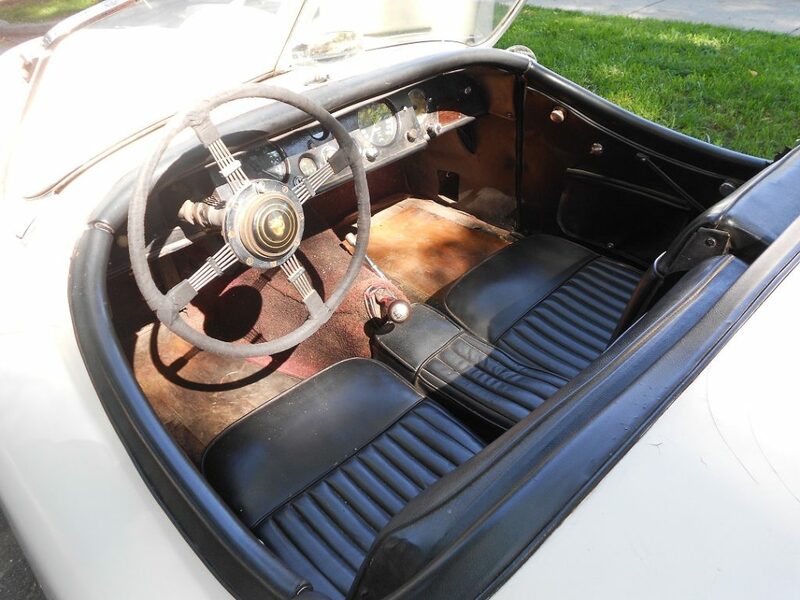 The side curtains are in very nice shape and the tonneau is aged but in pretty decent shape. 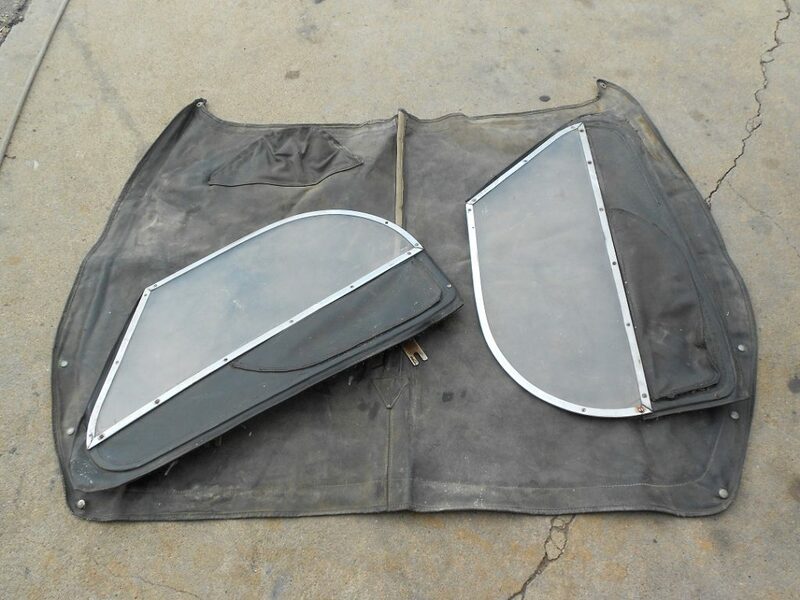 The soft top will need replaced; however, the frame is complete and the chrome rear window trim rings for the top are with the car. 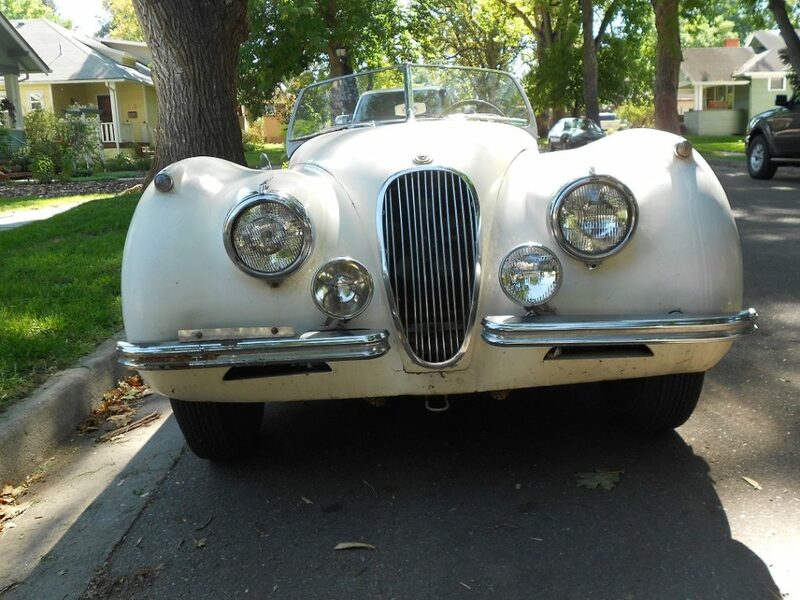 All XK 120 cars had independent torsion bar front suspension, semi-elliptic leaf springs at the rear which were originally wrapped with leather gators and are still on this car (! ), recirculating ball steering, a telescopically adjustable steering column, and 12 inch drum brakes all around. 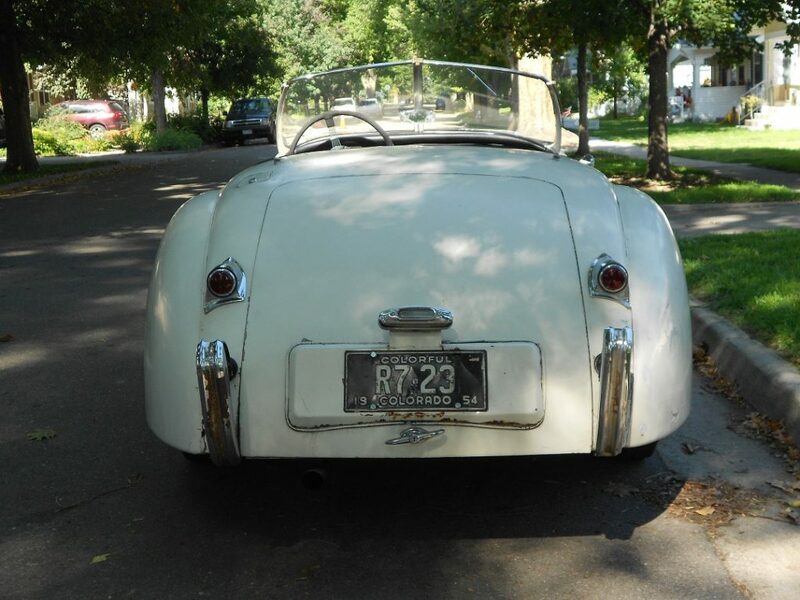 The car is 14’5″ long and is but 5′ 1 1/2″ wide and 4′ 4 1/2″ high. The wheel base is 102″ and the car weighs 2,744 lbs.. The car was designed by Sir William Lyons and built by Jaguar Cars Ltd, Browns Lane, Coventry, England. 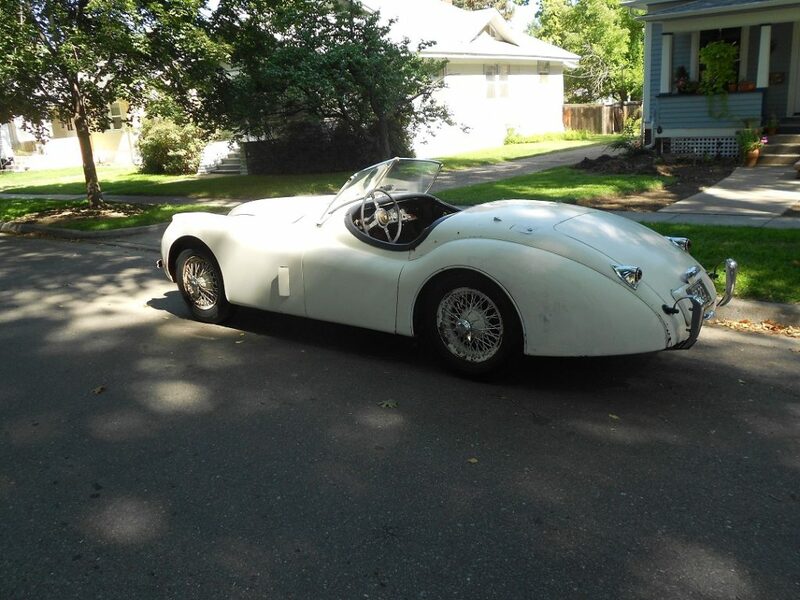 Jaguar XK 120 SE, Open Two-Seater, Left Hand Drive. Date of Manufacture: July 5, 1954, Dispatched to Max Hoffman (Importer/Dealer), NY July 14, 1954. Original Colours: Exterior: Cream; Interior: Blue; Hood (Soft Top): Black. This is an exciting, rare car to own and drive. 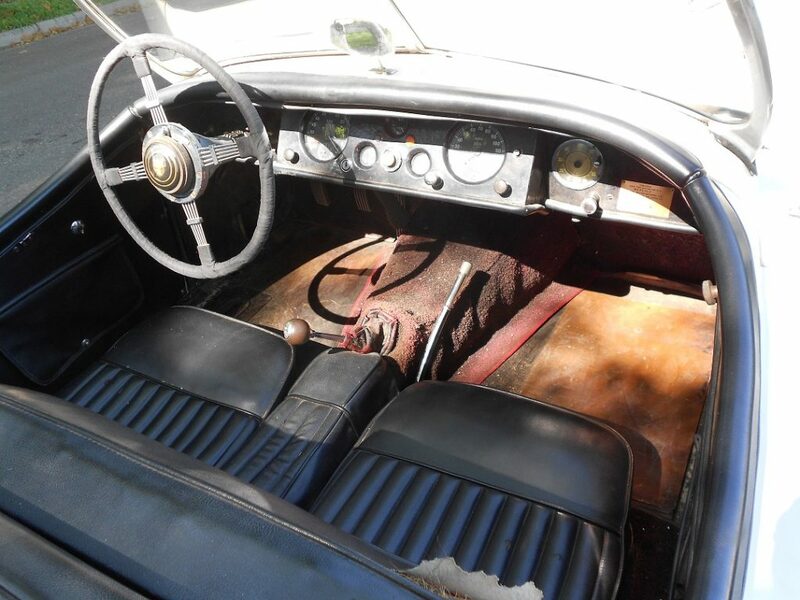 Drive “as is” with patina or restore.